The Solution below shows the position of note E-sharp on the piano, treble clef and bass clef. This step shows note E-sharp on two octaves, on the piano, treble clef and bass clef. E# is a white key on the piano. Another name for E# is F, which has the same note pitch / sound, which means that the two note names are enharmonic to each other. 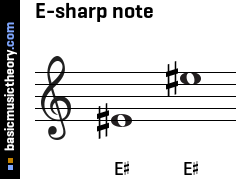 It is called sharp because it is 1 half-tone(s) / semitone(s) up from the white note after which is is named - note E.
This step shows note E-sharp in two different positions on the piano, and describes the note characteristics. The next note up from E# is F# / Gb. Or put another way, F# / Gb is 1 half-tone / semitone higher than E#. 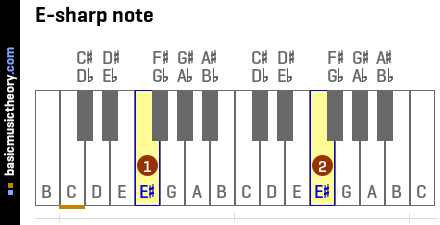 The next note down from E# is E.
Or put another way, E is 1 half-tone / semitone lower than E#. There are no black keys between E# and E.
3. Note E-sharp is found in which scales ? This step shows which scales note E-sharp occurs in, including the scale degree (ie. position / scale note number) of that scale. 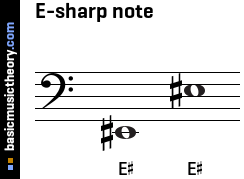 Note E-sharp is found in which scales ?